If, like most families, your home is cluttered by belongings that are frequently in demand but a pain to store, you could benefit from incorporating a boot room. At its simplest, a boot room functions as a practical storage solution that can be created by re-organising a hallway or borrowing a portion of an existing kitchen. Use it for some handy extra coat and shoe storage or, if you are working with a larger space, a boot room could double as a utility area, too. A fully fitted, well designed boot room will be planned and executed in the same way as a small kitchen – take a look at our guide to designing a small kitchen for advice – with a price tag to match. Ready to go? Don't miss our boot room design ideas, too. How you will use a boot room? When designing a boot room be clear from the outset what you want to use the space for. Is it a boot room solely for storing shoes and coats? Would you like it to have a sink? Maybe it needs to double up as a utility room? Think about those things around your house that don't have a home but could definitely do with one (this is where a boot room comes into it's own). Bikes are the perfect example of this, consider adding some wall mounted racks or out of the way on a pulley system to your boot room design – take a look at our bike storage ideas for inspiration. You could also use the space for indoor gardening, a bit like a potting shed, just add a work bench and repurpose some shed storage. Where is the best space for a boot room? In a typical farmhouse, a boot room is positioned by the back door, so that you can stomp in with muddy boots and change out of wet weather gear without traipsing mud through the house. If you’re embarking on a renovation project, planning an extension or fitting a new kitchen, now’s the time to see whether the ground floor could be reconfigured to include a boot room. For most homes the front door is the main port of call, and adding a porch might be the answer to avoid dirty trainers and school bags being trailed through the house. Without resorting to building work, an existing utility room can double up as a boot room. The flow of the space through a boot room is the first consideration. The ideal space needs to be one you can pass through quickly with little furniture obstructing the route between the doors. You also need to consider having a door separating your boot room from the main house to keep cold air out. Depending the boot room size, the furniture can be arranged in a row or in an L- or U- shape, in the same way that you might have a small kitchen. Would it help to move a door, window or radiator to achieve your aims? Could the amount of daylight be improved, if you include a skylight or glazed doors? Could a downstairs loo be incorporated? See our design ideas for U-shaped kitchens and L-shaped kitchens to get some inspiration for your boot room layout. 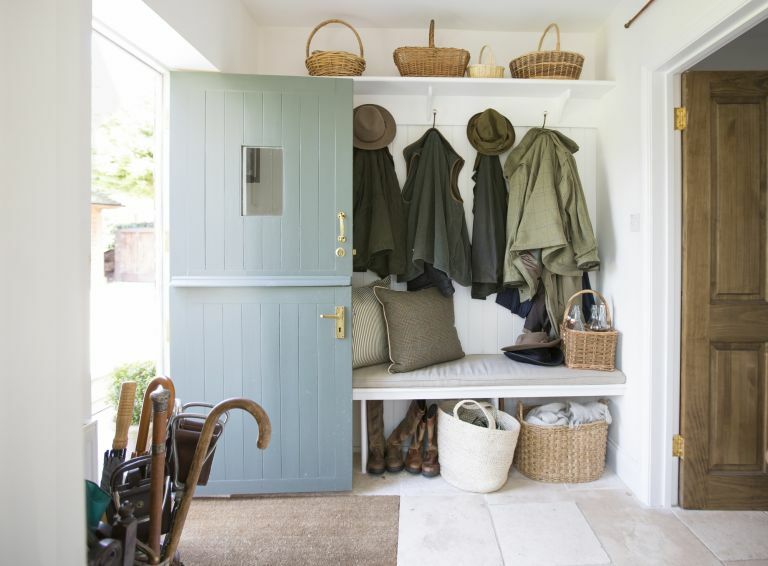 Essentially, three levels of storage are required; shoe storage goes at the base – a bench with cubby holes beneath is ideal – then hanging racks for coats and jackets. Above head height, shelves can take hats or lesser-used items, such as sports gear. For extra boot room storage, consider a bench with lift-up seat, or baskets. Wellies are best stored on taller shelving or on a rack. Fit peg rails to the wall for coats; a rail at a lower level allows for children’s jackets. Make sure the pegs or hooks protrude far enough to take more than one item. As an alternative, go for an all-in-one hall stand, a multi-functional freestanding piece of furniture with storage and hanging space. Don't forget, too, that it's a room that will see plenty of messy clothes, so it's worth considering laundry room storage ideas, too. Fitted boot room furniture naturally costs more but does make use of every inch, and it can be configured precisely for the items you want to store, incorporating built-in benches with lift up storage, a mix of open and closed shelving and cupboards and peg rails. If the boot room is to double as a utility room with a ‘wet’ area for a sink and washing machine, you’ll want a practical, hardwearing worktop, cupboards or open shelving above and below, and adequate sockets. Select finishes that can be wiped clean – if painted they will be easy to touch-up when knocked or damaged. Adding a sink to a boot room keeps all the messy jobs out of the kitchen. A tall tap with a swivel spout makes cleaning off boots and garden tools easier. When there’s no space for a sink, an outdoor tap by the entrance is a practical choice. In a larger boot room, a drain could be incorporated in the centre so that dirt can be swished away. Got a dog? It's the perfect place for a dog shower, too. At the planning stage, consider whether plumbing should be added for a washing machine. Plan the position of electrical sockets so they’ll be useful for recharging DIY tools or for carrying out tasks such as ironing. Consider lighting options, and whether a radiator or underfloor heating would work best. For a traditional and hardwearing finish, fit the lower part of the walls with tongue and groove panelling, painted to match the storage. Not only will this give the sports pavilion vibe but once the wood is protected by a tough eggshell finish, the surface can simply be wiped down if it gets scuffed. If painted walls are your choice, select a durable version such as the Hall & Stairs Durable Matt range of super-scrubbable paints from Crown. Check out our pick of the best washable paints that would be perfect for a boot room. Laying flagstones or reclaimed bricks will give your boot room the country vibe. Not only will they give a timeless impression, but they’re immensely durable and look even better with a few knocks and scrapes. Stone tiles, however, do need to be sealed occasionally. have a read through our guide to choosing stone flooring for more advice. Among the alternatives, porcelain tiles can imitate stone accurately, yet are thin and lighter in weight than the real thing, and are easy to care for. Luxury vinyl tiles are ideal for a hall or kitchen with an adjacent boot room, providing an opportunity to give a contemporary feel with on-trend pattern. Finishing touches for a boot room can be practical as well as attractive. Place a boot scraper by the door, a rack for keeping wellies upside down to drip dry and an umbrella stand. To get the country look, revamp old furniture with a fresh coat of paint (check out our guide to painting furniture to DIY) and add wicker baskets or crates for storage. Looking for more boot room or storage inspiration?